Bogen Communications, long respected in the field of telephone peripherals and sound systems, is an outstanding leader in the modern paging market. Bogen Paging is recognized nationwide and internationally for its quality and versatility. Bogen Paging products supply every paging need from simple paging microphones and speakers, to small school or office environments to enormous theaters and concert halls. The Bogen PCM2000 paging system is highly expandable through use of multifunctional modules, allowing a high degree of flexibility throughout varying building zones. The equipment available for Bogen paging systems allow for almost unlimited growth and adaptability. This Bogen paging system allows for up to 32 paging zone groups, features one to 99 zones of simultaneous low and high power paging, and is field programmable. Background music can be assigned in varying zones, with local music source capability. Amplifier power allowed is up to 250W. It can operate in temperatures from 25 to 100 degrees F and up to 90% non-condensing humidity. The Bogen PCM2000 Zone Paging Module provides three paging zone outputs, for example, and can be expanded simply by adding additional modules in up to three zones at a time. You can set the output from high to low power and the zone outputs can drive self amplified or 70V speaker systems. There are also BGM and talk-back options. Looking for hands-free talk back communication through your paging system? The Bogen PCM2000 Talk-Back Module will do the trick! A real time clock is built in and allows for synchronization with a master clock. This module provides a noise reduction switch, volume and delay controls, along with amplifier connections. You may be requiring a phone interface module, and the Bogen paging system makes room for that requirement. The Bogen PCM2000 Phone Interface Module allows you to connect to any part of the phone port with input for emergency page over-rides and night ringer. It features a C/O line and PBX station access. Offices, schools and other facilities needing versatile overhead paging can look to Bogen paging without the concern of running new lines. The Bogen 1-Port FXS/FXO VOIP Gateway with Overhead Paging. 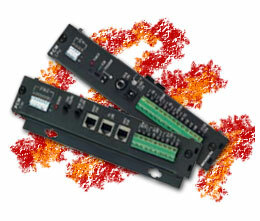 This system allows for integration between phone access modules, amplifiers and voice over IP gateways. Thus your system is wire free and Ethernet compatible. Users can page remote locations and campus wide office buildings seamlessly, while utilizing just one port. The system provides a PSTN fail-over feature that automatically routes calls over PSTN should the IP network go down or become too congested. This Bogen paging system allows user-friendly management and configuration through Windows or web browser. Voice prioritization and compression are included in the system, and there's also FXS for analog connections to phones, CO ports, and faxes. The system supports H.450 supplementary services to provide for call transfer, call forwarding, call hold, call waiting and name identification, as well as supporting H.323 or SIP for sending voice over the Internet. Today's paging needs can be simple or complex, but should always be met with high quality and user-friendly systems. Why not look to Bogen, communications leader and manufacturer of world-renowned Bogen paging products?